Before you dash off to the store, you go through that little checklist. (Your list is probably similar to mine.) Wallet? Check. Keys? Check. Cell phone, shopping list, gun. Check, check, …wait. You don’t go shopping with your gun? Why not? If you live in Missouri you have the right to. It’s one of the joys of living in an “open carry” state. Open carry means that as long as you legally own a gun you can proudly wear it in plain view of everyone. Now the idea of wearing your gun to go grocery shopping may sound odd, but on March 12, a man did just that in my neighborhood. And it caused a small uproar. Let’s take a moment to talk about that little incident. On March 12, Brett Darrow was in the checkout lane of the Maplewood Wal-Mart. He was wearing a gun, it was clearly visible. Other patrons had seen the gun and alerted some store employees, who in turn called 911. He wasn’t behaving weird, he wasn’t causing any trouble. Brett was just wearing a pistol and that made people uncomfortable enough to want to call the cops. (Once the cops showed up, he refused to identify himself and they arrested him for an outstanding traffic warrant, but that really isn’t important.) The important thing is that it’s perfectly legal to be out in public wearing a gun. That might be changing in my neighborhood. The city council of Maplewood decided that maybe being open carry wasn’t such a great idea. (Remember, just the sight of one gun at Wal-Mart was enough to make people nervous. Imagine what would happen if we all started packing heat.) They proposed an ordinance that would ban open carry in our city of about 9,000. It gets voted on Tuesday, April 12, 2011. The ban is expected to be a shoe-in. But that only matters here in my backyard. The whole state of Missouri is legally open carry. It’s up to the local government of each city whether or not they want their citizens carrying guns in plain sight. 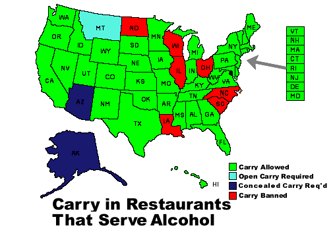 All of the states in green are places where you and your gun can get served a beer. Missouri isn’t alone in its open carry status. According to OpenCarry.org (a self-described, “pro-gun Internet community focused on the right to openly carry properly holstered handguns in daily American life.”) 27 other states are open carry without a license. 14 states are open carry with a license. All together that’s 41 states in which you can wear a pistol out in the open at a Wal-Mart. And don’t think it’s just grocery stores or big box stores where you can wear a gun. Open carry applies to bars, restaurants, churches, political rallies, offices, hospitals, movie theaters, parks, and even some airports. (Colleges, schools, and some government buildings have restrictions, but it generally varies state by state.) Businesses have a right to refuse service to someone with a gun and some places will have signs saying whether or not guns are allowed on the premises. Even with a few exceptions, that’s a long list of places you can go armed. It should come as little surprise then, that I’m not a big fan of the open carry law. It’s not that I mind guns. I’m fine with hunting. I even own a pellet gun. It’s fun. But it’s the fact that we have some lenient gun ownership laws that make me uncomfortable with open carry. Even though I live near the city with the highest crime rate in America, (Go St Louis!) I feel safe. I don’t feel like I need to take a gun with me everywhere I go to defend myself. Safety and security are one of the perks of living in a civilized society. Despite all of our political bickering and trashy reality television, I’d like to think we live in a civilized society. In all honesty, if I were picking up groceries and I saw a person wearing a gun, I’d call the cops. Because I trust police. I don’t trust the random guy in aisle 3. So the next time you’re shopping, please leave the gun at home. Most of Maplewood agrees, it just makes us feel safer.